The World YWCA is actively participating in the AIDS 2012 Conference in Washington taking place this week. It was a longer and warmer walk than expected to the National YWCA office in Washington, DC where the World YWCA Young Women’s Leadership and Advocacy on SRHR and HIV was held. Navigating the metro system with 17 women was an adventure requiring numerous head counts, and everyone was excited to finally arrive and enjoy a breakfast sponsored by Tamara Smith, CEO of the National Capital Area. We were also greeted by Rhonda Bishop as representative of the YWCA USA. Lintu George (YWCA of India) and Monica Tobias Simon (YWCA of Namibia) led the morning worship services with a reading from the Song of Solomon and reflected upon the beautiful message that God has given and called each one of us by name and created us in His image. 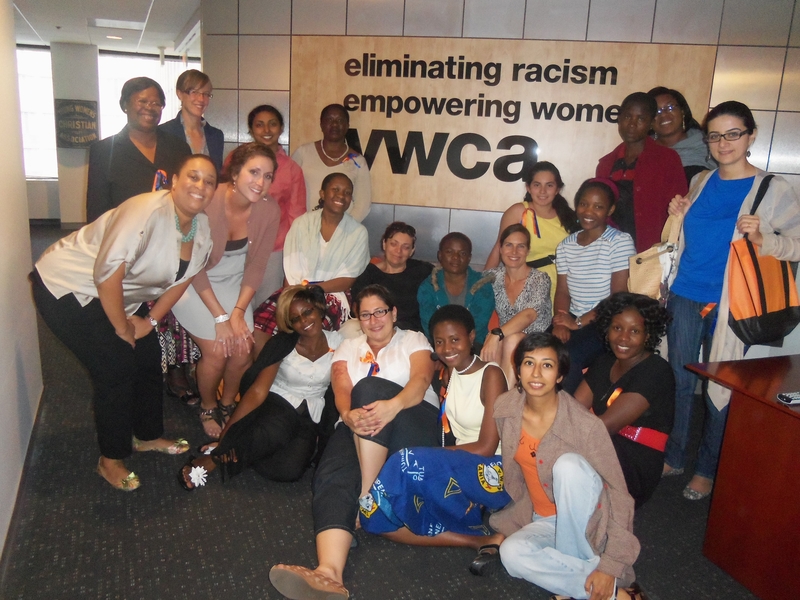 Each YWCA participant had an opportunity to share some of the work they were involved in; it was apparent that the YWCA is united in the struggle to empower women, young women and girls. Following introductions, Melissa Hillebrenner (Girl Up Deputy Director, UN Foundation) did a presentation on how the Girl Up campaign was educating and involving young girls in the US on leadership and fundraising initiatives to support their peers in various other countries (Malawi, Ethiopia, Guatemala, and Liberia). In just a few years the project has involved 240,000 US girls and raised 3 million USD to be given towards health, safety, and education, leadership, and ID initiatives. Rebecca Phiwitiko, World YWCA Board member from the YWCA of Malawi, and Jenna Lodge, from the YWCA USA spoke about Integrating a Gender and Human Rights approach to implementing services. They placed emphasis on informing practice through consulting with program participants in a bottom-up approach, but also as advocates to act as a bridge to bring these issues forward to government and policy makers. CSW, CEDAW, and the Human Rights Council were reviewed as opportunities for individuals or organizations to hold their country governments accountable and honest in addressing gender and human rights. Lintu George (YWCA of India) presented information on the World YWCA Strategy on the priority of HIV and AIDS. This included building leadership skills, especially in young women, prevention through education and safe spaces, influencing local and global policies, and supporting all of these actions through communication and documentation. Nagham Nassar , Programme Associate, Communication Department at the World Office, shared with the delegation information about the movement and how it is built. They talked about the three goals in the strategic framework for 2012/2015 and live examples from each country came up along the presentation. She also shared the structure of the movement that starts with the membership to end up with the staff in the world office. The participants were really eager to have more detailed information about the association. Early in the afternoon Kuena Diaho (YWCA of Lesotho), Monica Manoni (YWCA of Tanzania), and Hendrica Okondo (Global Programme Manager SRHR & HIV and AIDS,World Office) reflected on a Bible passage (Deut. 30:19) which encourages to “choose life” and protect women. Another passage from the Bible was read by Monica Manoni as an introduction to the Tamar Campaign. Marcie Martinez (YWCA of Belize) and Arielle VanDerWeide (YWCA Canada) facilitated a discussion on this passage and how faith intersects with SRHR and gender based violence. Faith and faith communities can often be central in supporting and guiding women, but it can often be abused when scriptures and misguided teachings can be used to pressure women and their children to stay in harmful situations and to justify abuse or blame women for the abuse they receive. Marjorie Herrera (YWCA of Chile) presented work on SRHR that her association is doing with young women and girls. After a lunch (sponsored by YWCA USA), Jennifer Catino and Andrew Karlyn (Population Council) demonstrated how the information their organization gathers can and should be used to inform practice. A short film “Girl Effect” showed the risk and protective factors that influence girls’ development, and further statistics and information illustrated that while girls are at the highest risk of SRHR violations and of contracting HIV, girls’ programs are underfunded and often ill-informed. The day was a good preparation for the week ahead. Logistics, responsibilities, and group scheduling was reviewed before we closed the day and headed back to the residence. A reception for the Interfaith Pre-Conference with drinks and canapés was the finale for the day and set the tone for the following week which is sure to be full of networking, strategizing, and learning.